A No-Kill shelter saves all treatable and adoptable pets. This means 90%-98% of incoming animals are saved. Only animals that are too sick to be treated or too aggressive to be rehabilitated are humanely euthanized. A pet is NEVER killed due to lack of kennel space. A No-Kill shelter can be open admission and accept all animals. The average length of stay can be shorter than traditional shelters because animals are adopted quickly or placed into foster homes. Every community that has achieved No-Kill status has followed the same 11 steps to success. I Like The Idea, But Can It Really Be Done? Yes! We have been told shelters are forced to kill because there are just too many pets. This is not true. 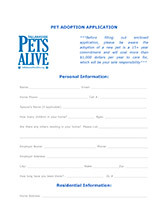 Nationwide, 23 million people will get a new pet each year. Some will buy from a breeder or other source, but 17 million don’t know where they will get their new pet. Shelters kill 4 million dogs and cats yearly. If we could sway just 4 million of those 17 million undecided people to adopt from a shelter, we would end shelter killing. In other words, even if 80% of the undecided group got their animals from someplace other than a shelter, we would become a No-Kill Nation! It can literally happen overnight once we commit to using the same proven methods other cities have used! By helping animal control departments, animal welfare organizations, animal shelters and animal lovers and animal advocates learn about and implement both proven and new solutions in development all across the United States. We will work with all responsible groups who are working toward the greater cause of companion animal life-saving and long-term, No-Kill solutions for our homeless pets. 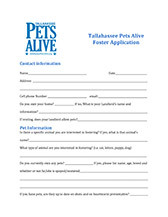 Florida Pets Alive! 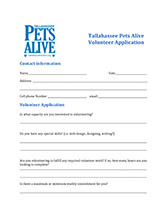 believes it is possible to save every "adoptable" animal in Leon County. This does not mean that no animal should be euthanized. We believe that animals suffering from illness or injury that cannot be treated and dogs that are truly aggressive and cannot be rehabilitated should be humanely euthanized with gentleness and compassion. As of this writing 30 open admission city and county shelters including Austin, TX, and Reno, NV have successfully achieved No-Kill status. Eight others are in progress including Manatee County, FL, and Jacksonville, FL. The list is growing every day. If they can do it, so can we! Please help us put Leon County on that list!